Are housing companies such as Unitech too big to fail? It is well-known that the realty sector is rife with myriad such cases of defaults in delivery timelines, but why single out Unitech? Last Friday, the National Company Law Tribunal (NCLT) suspended the present directors on the board of distressed realty firm Unitech Ltd. Simultaneously, it permitted the ministry of corporate affairs (MCA), which had made an application to take charge of the firm in order to safeguard “public interest", to suggest names of 10 new nominee directors by 20 December. What constitutes “public interest"? In this case, “public interest" was invoked because there were 19,000 home buyers stranded for several years, 51,000 small depositors to whom the company owes a total of Rs723 crore, and several institutional lenders and creditors. But loans and small depositors are common to many other distressed firms—what seems to have invited government intervention is the plight of home buyers. The additional solicitor said as much when he told the tribunal that they wanted to avoid insolvency proceedings for the company because 19,000 home buyers would be left high and dry. 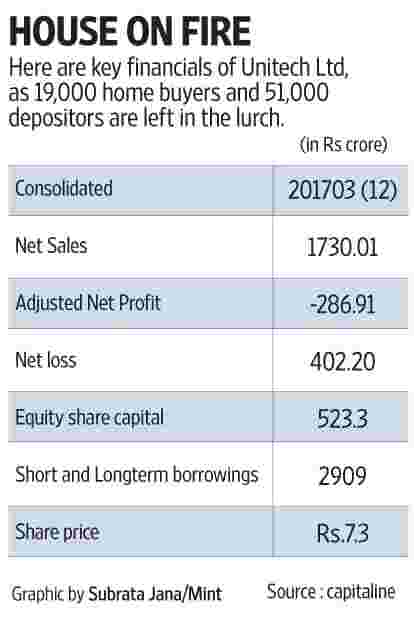 Unitech is in deep trouble—its borrowings scaled Rs6,000 crore by end-March 2017, with no cash-flows to service the debt, given its consolidated loss of Rs402 crore on a revenue of Rs1,795 crore during the year. Moreover, the NCLT order cites a “large number of other irregularities that have been investigated…"
Some draw an analogy with Satyam Computer Services Ltd’s case a decade ago, where MCA stepped in to find suitors for the debt-laden firm that was among the top five IT firms in India, after a confession by the promoter of fraudulent transactions and fudging of accounts. The company was finally sold to TechMahindra. But that case was different from Unitech, not least because the realty company denies any wrong-doing and the charges are yet to be proven in a court of law. But then, the savings of supposedly ‘middle class’ people were not at stake in the Satyam case. Satyam was noticeably one rotten egg in the IT basket. Unitech is one among many rotten eggs in the realty basket. It is well-known that the realty sector is rife with myriad such cases of defaults in delivery timelines. Why single out Unitech? If the move is intended to bring defaulting home developers to book, then the apex court was already carrying on the task. In the recent past, the Supreme Court has been addressing consumer cases against several developers such as Supertech, Jaypee Infratech and even the Sahara group. In September, it even ordered Unitech to refund Rs7,816 crore to distressed home buyers within a stipulated period and also stated that the two promoters, currently behind bars, would be released only against a deposit of Rs750 crore, nothing less. However, the NCLT ruling has a new twist as it has restrained the directors from mortgaging, alienating, creating lien or interest in any of the properties owned by them or by the company, even after their removal, until the investigation is complete. Perhaps, this was prompted by the alleged misappropriation of funds even after some assets were monetized. Note that Unitech had about 240 shell firms or subsidiaries listed in its annual report. Incidentally, industry body Ficci has said that restraining directors of a firm from alienating their personal properties may impinge on the concept of limited liability. But the question remains: what makes Unitech home buyers and depositors different from scores of others in a similar boat but with other developers? Is it because it is larger in size? Clearly, a default by Unitech will not lead to any systemic default. Is this move then expected to set a precedent in the real estate sector to minimise wilful default and graft that was rampant in the realty sector because of lack of proper regulation? Will MCA step in to punish all errant realty firms? Will all realty firms be deemed too big to fail? To be sure, the implementation of the Real Estate (Regulation and Development) Authority Act, 2016, was also a step to bring in transparency and accountability. But Unitech’s stranded projects are old and are yet to be compliant with RERA norms. Perhaps, instead of trying to protecting home buyers on an ad hoc basis, bringing the homebuyers’ claims into the category of secured creditors may build greater confidence among those looking to buy homes. For instance, it may help if it were to be declared that advances given by home-buyers are held in trust for them, perhaps taking them out of the insolvency purview. For now, under Section 53(1)(f) of the Insolvency and Bankruptcy Code (IBC), home buyers rank at the tail end of the list, just ahead of preference and equity shareholders. “Ideally, a more comprehensive and self-contained IBC, which deals with such corporate matters, should have exclusively applied, instead of having multiple laws/regulators," says Jayant Thakur, a chartered account and specialist in securities and corporate law. The questions now are: will things change for the better with MCA stepping in? Will the new board be able to raise money to settle the scores of claims? MCA’s intervention is aimed at taking the firm to the next logical step—quickly assess the assets and liabilities by an independent new board and find suitors to the firm or the individual projects. Or they could simply monetise assets to pay off depositors and home buyers. Punters have been quick to pile into the stock, driving it up 20% on Friday. However, implementing any resolution is going to be very difficult, given the state of the housing market. Allegations of diversion of funds and the intervention of the apex court are other factors that increase the uncertainty. While the MCA action may help home buyers, it is unlikely to be good news for investors. One common factor between Satyam and Unitech is that equity investors were left with gaping holes in their pockets. In the case of Satyam, when the news of the scam broke, the stock plummeted from Rs542 to Rs6 in a few trading sessions. Unitech’s stock, too, has fallen steadily and was languishing at around Rs4, down from the Rs500 levels it scaled prior to the Lehman crisis. Its recent jump is no reason for bottom-fishing. For the investor in property, even a partial redressal would be good. For the government, it would send a signal that they care for home buyers. But the equity investor who chose to bet on Unitech’s stock may have already lost it all. Indeed, the MCA’s action and the questions it raises for creditors and promoters might, perversely, slow down the process of recovery in the residential market. It also poses questions for the efficacy of the recently introduced bankruptcy process, at least so far as realty companies are concerned.